We've had chickens for four winters now and, for the first time, it seems as if the egg-laying stars have aligned. Our flock of Ameracanas and both Golden and Silver Laced Wyandottes (and a few half-breeds) have always slowed down in their egg production each winter. We've found that the two most important factors in good egg production are 1) making sure the birds have plenty of water and 2) giving them long days. During the winter, the day light hours are significantly less and this leads to less eggs. We hang a lamp in their roost that is on a timer. It turns on early in the morning, shuts off when it's daylight, turns back on as the sun goes down and shuts off later in the evening. All this to say, every winter we try to provide the perfect combination of food, water, and light (and, as always, access to the great out of doors at all times). For some reason, since Christmas, our hens have been going above and beyond the call of duty. They are laying machines! This is what we came home to after Christmas travels. We were gone a week and have about 25 laying hens, although a third of them are almost five years old. Prior to Christmas, we were only getting a few a day. The one thing we can think of that may have jump started this laying frenzy is that while we were away, there was snow on the ground here. Our chickens are...well...they're wimps. They don't like snow and refuse to walk in it. So, while we were gone, they were holed up inside with unlimited feed (since we were away). Normally, when there is no snow on the ground, they spend a lot of their day outside, scratching for bugs and green blades. But even now that the snow has melted they keep laying away. So, if you're local and you'd be interested in eggs, keep an eye on my personal facebook page and I'll put the word out when we have extras to sell. I'm going to change the subject slightly and tell you something I've been holding off telling you. 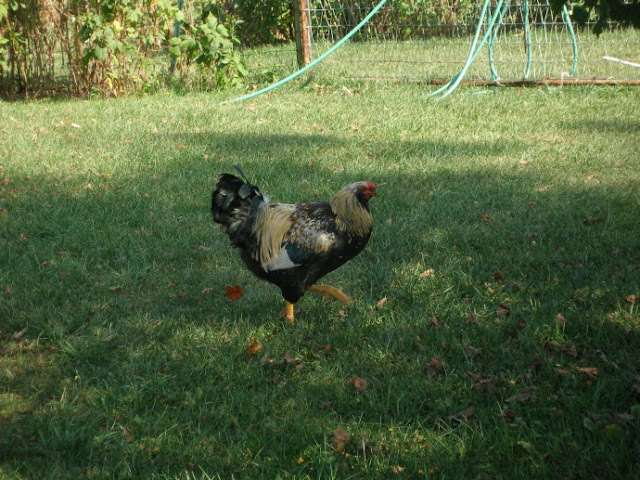 Remember our rooster, Marv? Well, this fall (months ago), we let him go. No, we didn't release him into the wild. We kind of fired him. And, around here, if you're a rooster and we fire you, it means you're freezer bound. If you'd like to read some of the best Marv stories and reminisce a bit with me, read here. Marv became one of those roosters who was over-zealous in his roostery ways. He crowed too early and too often. He pestered the hens too much. He turned on humans more than necessary (and even chased me around the garden a time or two). He was beautiful and he put everything he had into his job, but he failed to consider his owners and their offspring. Not that he should of. He was a rooster. Merv, Marv's son, was given a promotion and is now head rooster. Actually, he's the only rooster. He hardly ever crows. He doesn't pester the hens so much (it helps that there is no competition around). And, thanks to Marv, he's as timid as can be. While he may be a little too timid in the protecting-the-flock department, we're more interested in our children being protected. He's the perfect replacement. We thought the kids would be upset about the changes, but they went with the flow and now can even collect eggs by themselves (if they stand on a bucket). And, now, let's have a belated moment of silence for our literally fearless rooster, Marv. Thank you. You may be dismissed. I love the picture of the eggs with the sun glistening off of them! And farewell to Marv. I'm sure Merv will be an excellent replacement. We started our current flock of chickens with 4 roosters. One died of natural causes. And, the other 3 were dispatched to our freezer when they started going overboard in their roostery ways. Actually, one rooster in particular was the main culprit. (He attacked my children! Bad rooster!). 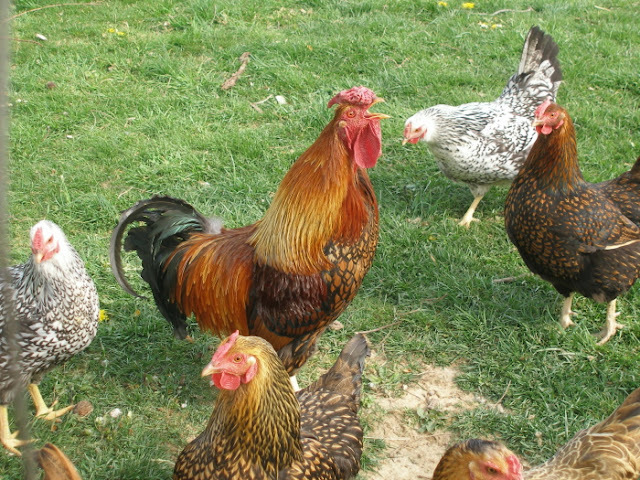 But, my husband said another rooster would quickly step in to take his place once he was gone and it was best to dispatch them all while they were still relatively young and the meat would be more tender. I just had to comment to say how much I'm enjoying your blog!! Loved the tribute to Marv! Ah yes, our rooster met with the same fate for the same reason. Good by Marv. Can you tell if your 5 year old hens are still laying fairly well? I will be over later with our Suburban to pick up all your eggs. I am so jealous. Our hens are still not laying. I don't know where you live but I will just keep driving until I find you. I think Merv is more attractive than Marv. Good decision. What a pretty picture! What is local? Appreciate the egg laying information! We also put a light in the coop this winter but have only gotten 1 or 2 eggs per day, if any, from 25 hens. I've been cooking my eggs from the freezer for Sunday breakfasts and rationing the fresh eggs for baking. That's a great photo of sparkly eggs. I admit, I'm incredibly envious of your chickens and eggs. I've been wanted to get chickens for several years now. Maybe this spring will be the time...provided we get the coop built. So I have 2 questions for you, chicken veteran that you are! Is 25 hens about right to keep a family of 5 well supplied with eggs, and have a few to share? And secondly, how much and what type of feed do you use? Thanks! Wow, all those eggs sparkling in the sun! We'll miss Marv, but I'd of done the same thing. Hope Merv works out well long term. I've really debated about using the light since I understand that the hens won't molt if they have all the extra winter light. Has that ever been a problem for your hens? Do the eventually go through a molting process anyway? My chickens haven't laid a stinkin' egg in WEEKS. It's been COLD...and I don't extend their days...so there ya go. We're not sure if the five year olds are still laying or not. I understand that there is a way of determining that- by seeing how many fingers you can fit into their vent. Three fingers means they're laying, one or two means they aren't. We haven't had the courage to try this out yet. We're the white farmhouse with black shutters on the right side of the road. I have your eggs all ready;-). "Local" means you already know where we live and you're willing to come pick the eggs up:-). Our 25 hens, on average, give us 10-12 eggs per day (sometimes a lot more and sometimes a lot less). This is way more than we can use ourselves. 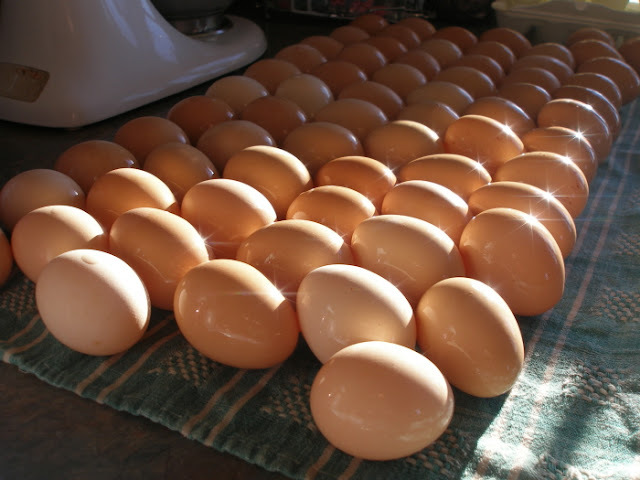 We sell about 10 dozen eggs a month (sometimes more, sometimes less). As far as feed goes, I'll have to ask Jamey when he gets home, so check back. I'm not sure ours molted last year, but I know they did two years ago. I hadn't heard of this before- it's fascinating. I'm going to pay close attention this next year. The hens look fabulous, so if they haven't molted it doesn't seem to be bothering them- at least not that we can tell. We had a rooster like Marv only we called him Fred! We gave him away but from what I hear he made it to the stew pot. He was a Buff Orpington and beautiful! We have 13 chickens and are only getting one egg every other day. We do the light also and actually a few of them (Light Brahmas) have been molting this winter. I miss our eggs and think it is time for some new chicks! My stomach churned a little when I realized that Marv met his end when you let him go. I wouldn't want an overly agressive rooster chasing me around either, but I think I'd have to leave the property for the firings. I'm too much of a wimp. You don't have to insert your fingers into the vent. You can feel the bones of their pelvis and you fingers go between the two bones. See slides 28 and 29 here: http://citnews.unl.edu/pase/ppt/Judging_Laying_Hens_files/frame.htm#slide0001.htm I just found this slideshow. IMO this looks like a poor hen who's been in a commercial operation. I do not condone keeping one's flock in such shape. This is just the first visual aid I found that could show what I was trying to explain. HTH! Well, the egg freezing didn't go very well, but it was due to my method, not the concept. I froze them without whisking the egg and yolk together first, so my yolks were rubbery and didn't incorporate well into the egg white. This summer, I will try it again. Thankfully, I didn't save too many this way, so the waste was minimal. Thanks for the clarification and the link to the slides- very helpful and much less icky sounding:-). thats hilarious! and what a beautiful picture of the eggs! around here we say "when you start to crow, you got to go!" we keep a couple roo's but the rest take their place in glory among the noodles. My hubby and I (actually I did, but he agreed quickly) that we're going to wait another year to get chickens. I think I'm mourning pretty well, considering. I put my Storey's Guide away until next winter. It is hard being a grown-up, but we made the right decision. Besides, there are plenty of amazing sources of fresh eggs from neighbors. We haven't bought commercial eggs for months. It feels so good to be supporting the local economy and not worrying about bad stuff in our food! We feed our chickens a "layer crumble" from a local agricultural cooperative. We've decided not to spend money on organic feed since we don't eat the feed directly. It's more important to us to spend our money on organic produce, which we eat directly. Also, we feel confident that during most months of the year our chickens are eating mostly bugs and plants (since they free range) and very little feed. Hi- Just wanted to let you know that we do not have your lifestyle but I appreciate your stories about Marv (and have we heard about Somersault lately) and everything you write about. I always want to try everything and you explain and picture everything so helpfully. I will miss ornery old Marv, but you're the boss!! Now I can't wait to see Merv do his thing.